“I am a big believer in the laws of attraction and the laws of reciprocity.” With an opening statement like that on his LinkedIn profile, you know meeting Benji Rosenzweig will be a rare experience. To be sure, meeting Benji together with his wife, Sarah, will make that experience doubly worthwhile. Benji and Sarah certainly personify the laws of attraction and reciprocity. Sarah and Benji started out as friends 10 years ago, working as volunteers with a spiritual connection to the Friendship House—a division of Friendship Circle in West Bloomfield, Michigan. At the time, Sarah was at Wayne State and Benji recently had moved to Detroit from New York. Self-described as a “Jack of most trades and master of few,” being only 23, and still working to find himself, Benji had started a construction business, and then was forced to leave after a back injury. So he turned to the employment counseling services of JVS, a program for which he has been forever grateful. Benji is a top-producing commercial real estate broker. All those attributes go into the balance of Benji’s and Sarah’s professional careers and family life today. 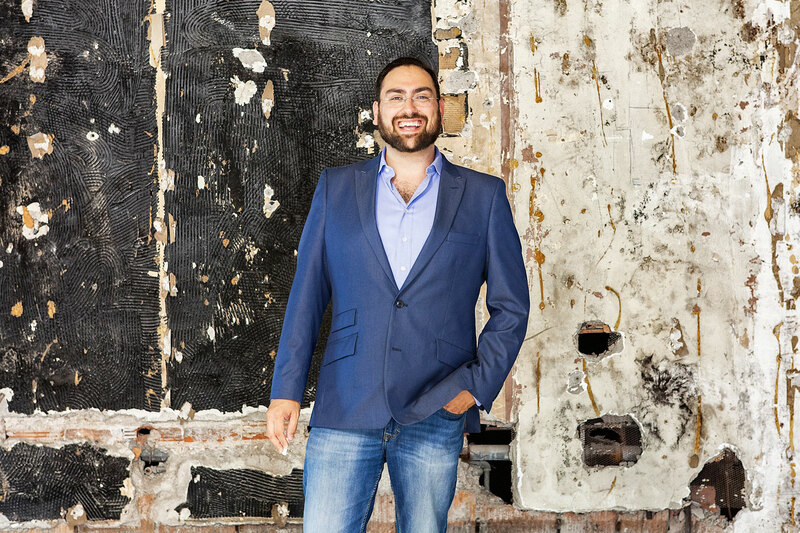 Benji is a top-producing commercial real estate broker with Indigo Centers, a commercial real estate firm in Birmingham where he is VP of Brokerage. He also describes himself as a music producer, a blogger, a marketer, a passionate Detroit advocate and a full-time dad and husband—with “the order of those things changing daily,” depending on how much sleep he gets. 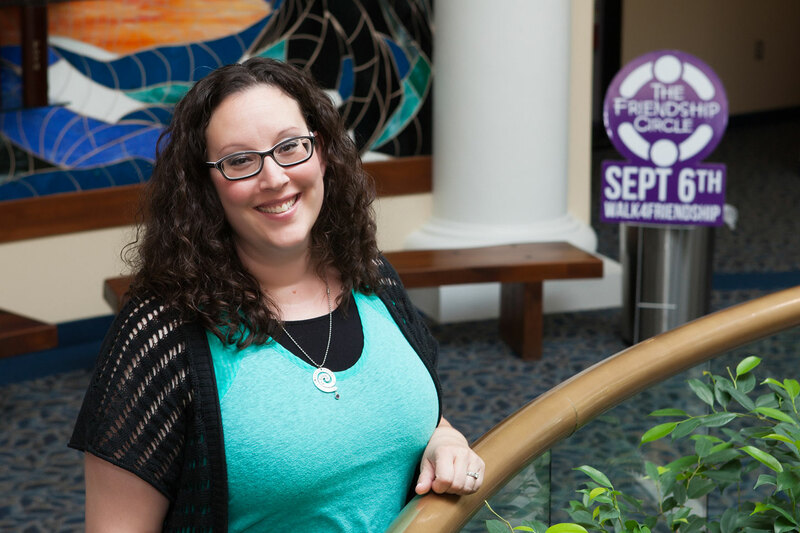 Sarah is a social worker with numerous letters behind her name that designate her Bachelor’s and Master’s Degrees from Wayne State University. She began her clinical practice more than a decade ago, has been a therapist for children, families, addicts and is now is a neuro rehabilitative therapist specializing in patients with brain injuries at Life Skills Village and a Geriatric Care Manager with Michigan Senior Planning. 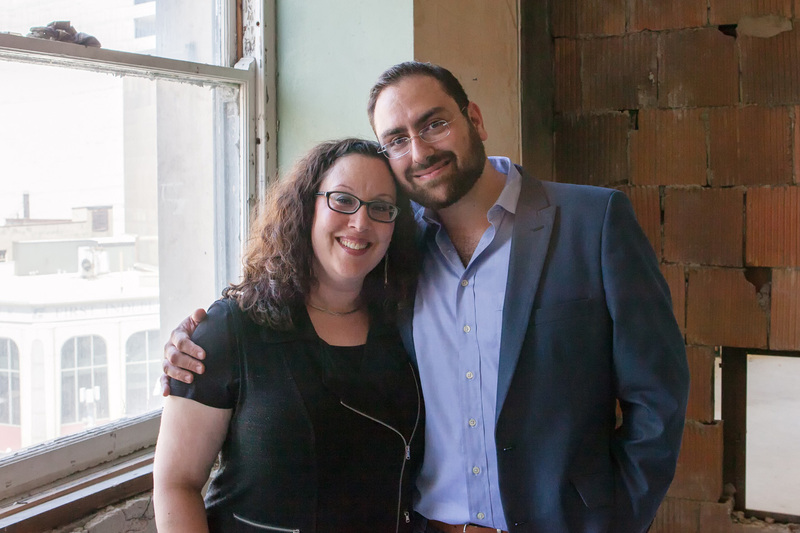 Breaking from what would typically be a busy afternoon with clients, Benji and Sarah meet myJewishDetroit at 751 Griswold Street—one of the many old buildings downtown in the process of redevelopment. 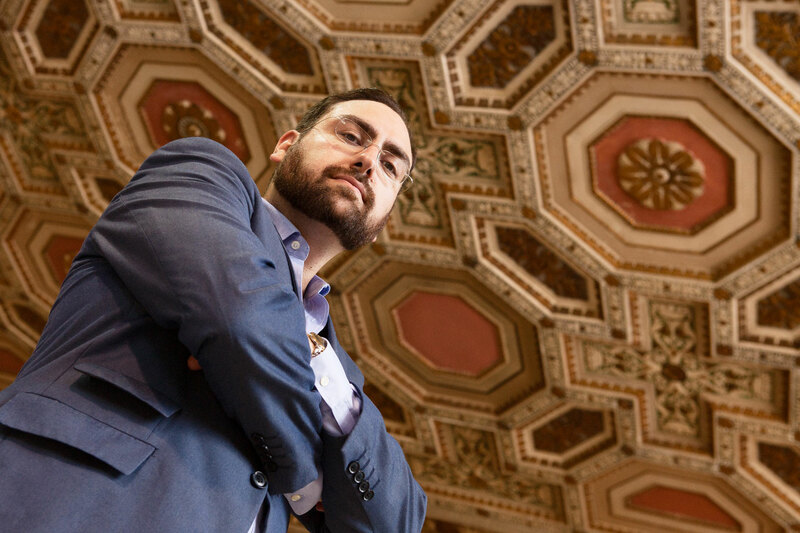 “Projects like this are something we work on quite a bit,” says Benji, as we marvel at the detail of the two-story ceiling of what used to be a bank. “We expect that very shortly this building will be fully occupied and thriving as another asset downtown.” Brokering the deal is on the long roster of projects in the city and on the homefront for the Rosenzweigs as we are soon to learn. myJewishDetroit: Benji, you’ve started many businesses, do you consider yourself an entrepreneur? Benji: While I’ve run a few businesses, primarily in music and consulting, today I have put most of that aside to focus on my real estate practice, my family and my community service. I suppose you could still call me a social entrepreneur, always looking for better solutions to problems in the community, but I don’t have the time to do it all. Life balance is a state of utopia I’ve heard about, but I don’t know what it looks like yet. myJDet: Benji, you are clearly a spiritual person—born in Tzefat. How do you think your connection to that “small mystical town in Israel” has affected you? My own Detroit roots are complex because my family lived in Windsor for six years and I crossed the bridge every day to go to school in Southfield. I wasn’t a ‘Detroiter.’ All told, I have lived in three countries, two continents and 10 cities. Moving as I have has forced me to work on developing relationships and creating roots and a building a history of my own for my wife, my children and myself. Sarah is a neuro rehabilitative therapist specializing in patients with brain injuries at Life Skills Village and a Geriatric Care Manager with Michigan Senior Planning. At 19, I left home to move to Phoenix—worked and hung out in New Mexico where my Dad lived, then moved on to Colorado. I returned to Detroit at the point I decided to go back to school. My intention was to get my education and move back out west. But then I met Benji. B: Without question, Detroit is now our home. My brother and his family as well as my dad are here, and anyone who knows anything about NEXTGen Detroit, knows my sister, Miryam Rosenzweig. 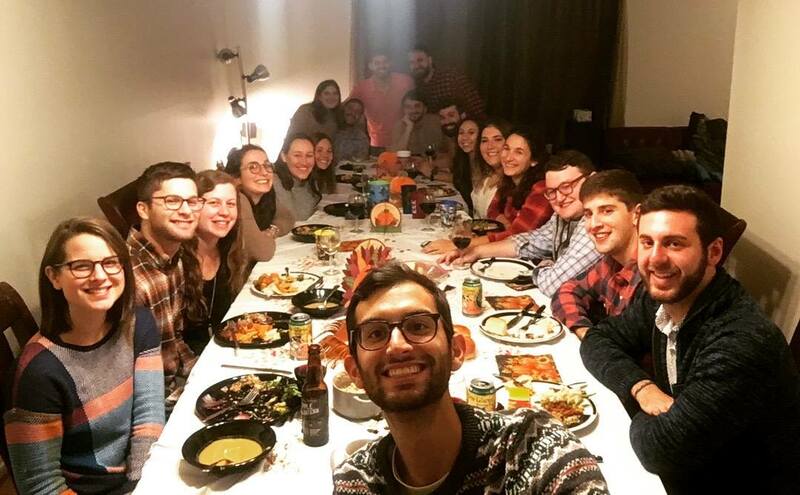 myJDet: Did you grow up with similar Jewish backgrounds? B: Actually, we grew up with very different Jewish backgrounds. My father is an Orthodox rabbi. My mother’s father was an Orthodox rabbi as well. I was in the Yeshiva school system my entire education and attended Yeshiva University in New York, so there may be an assumption of continuation there, but that was not for me. S: I grew up in the Reform Congregation, Temple Emanu-el, though some of my family was Conservative. B: Labels don’t really define us, our religious or spiritual beliefs. We are deeply affiliated with the Jewish community and committed to Judaism. We are sending our daughter to Hillel next year. The rest is commentary. myJDet: Benji, you’ve described yourself as “Jack of Most Trades, Master of Few.” How is that so? B: I know a little about a lot of things and I’m really good at a few things. Arguably, I’m good at sales, skilled in the real estate business—selling, leasing, and purchasing property. What makes me uncomfortable about the designation of “salesman” is that my outlook is not so much on selling people things per se, but on solving problems for people. I see my role as a connector and problem-solver. S: Benji has a gift of selling people on community. He has this uncanny ability to make connections with people and to see where there are spaces to be filled in. B: For me, it’s about putting the right people in the right room together, so ideas can come to life. I really don’t care if my name is on the end result. myJDet: Sarah, what drew you to social work? I was a speech and language pathology major, because I felt that the field was a little bit of everything I enjoyed doing—working with people, teaching, focusing on science. I needed an extra class to complete my credits in my Freshman year, and the one class that fit into my schedule was a social problems course. It wasn’t long before I knew that social work was what I wanted to do, particularly in light of my journey in my recovery, and the people who inspired me along the way. myJDet: Mentors? Who inspires you? Life balance is a state of utopia I’ve heard about, but I don’t know what it looks like yet. S: There’s Benji, of course. Those who also inspire me are the moms I am blessed to have as friends; my kids who teach me every day; my recovery community who have been my guide to learning about integrity and love now for over 18 years; and, of course, my parents. My parents, both hard working people who overcame a lot of adversity—taught me about perseverance and integrity—to be genuine, to be honest and to be empathic. I think those are the qualities that make me a good social worker today. myJewishDetroit: You both have many community connections. Name your favorites and why. B: Menorah in the D . . . started when The Shul asked me to help put together a program for Chanukah. And I said unless you’re going to do something buck wild and a must-attend event, I wasn’t interested. To compete during the holidays for those few nights that get filled with family functions, our event had to be something special and different, a celebration people just had to attend. So they asked me what I would do, and right off the bat I answered, “Build a ten-foot ice sculpture in Campus Martius, that will get people’s attention.” And they said great. Here’s a budget, let’s do that. That was four years ago. 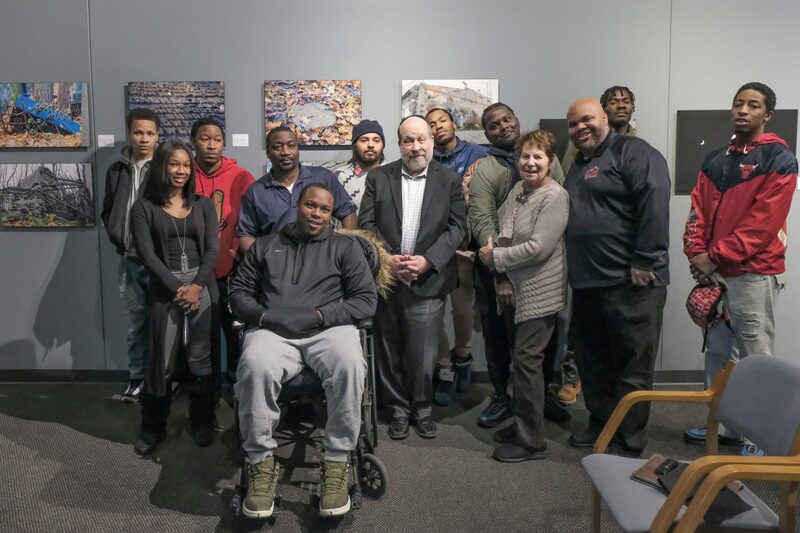 Rabbi Yisrael Pinson of Chabad of Greater Downtown Detroit, Yakova Stein and I worked together with Rabbi Kasriel and Itty Shemtov and leadership at The Shul in partnership with Federation’s NEXTGen Detroit. Our goal was to have 300 people at the first event. We had 650. After that, we hired the Nordin brothers from the Detroit Design Center to build a permanent 25-foot steel and glass menorah. Last year the event drew more than 2,500 people. NEXTWork—a partnership of JVS and Federation’s NEXTGen—is another project I’ve been involved with from the start. I had been involved with JVS since moving back to Detroit and, even though I had tapered off some of my work on the board, I still served on their Strictly Business Committee where I was part of the team which initiated the Rising Entrepreneur of the Year Award with the goal to get more young people through the JVS doors. That evolved into the series of business networking events we call NEXTWork—which puts JVS and Federation’s NEXTGen Business Hub on the same page to bring young professionals and business people together. So far, we’ve held five rock star NEXTWork events. Friendship Circle and all of their amazing programs for the recovery community and for kids like Ellah. The Farber Soul Center, a new studio facility of Friendship Circle geared to young adults with special needs. The Center is scheduled to open in its permanent home by the end of the year, but currently there’s a “mini” Soul Center is open and operating. The Soul Center is precisely the kind of development in our community that makes us say ‘why ever leave’? Because it’s going to be everything our daughter will need in her future—which we see as getting brighter every day. myJDet: Benji, You’ve written a Vision Statement for your daughter Ellah who has special needs . . . please share. Our daughter Ellah was born with an extremely rare neurological condition called Agenesis of the Corpus Callosum (ACC)—a disorder characterized by a partial or complete absence of the bridge inside your brain that connects the two cerebral hemispheres. In retrospect, it was absolutely terrible advice, because we missed a lot of good information about supportive families and organizations and research that we didn’t know until Ellah was almost three years old. Thanks to a conversation my sister Miryam had with a colleague who had a daughter with the same condition, we discovered a wealth of resources, including the National Organization of Disorders of the Corpus Callosum (NODCC). We then attended a conference in Boston where we were reminded of the inspirational story of Napoleon Hill, one of the earliest proponents of positive thinking and author of the classic, Think and Grow Rich (first published in 1937). In a nutshell, Hill’s premise was that a positive mental outlook could change the course of your life. To make something happen, you have to believe it and wake up every morning and say this is what I want and this is what I’m willing to do to make it happen, and then put it out there for the world to know. S: We started the blog to share our story and focus on ACC for two reasons. First, because no family should go through what we did only to find horror stories when they search online. We want them to easily find relevant information when Googling ACC. Second, because we believe everyone around Ellah needs to know about her challenges—and her abilities. It’s called social scaffolding—and it means those around her understand how to keep her safe and connected—helping her reach her full potential. myJDet: What’s the best parenting advice you’ve ever received or given? B: I think the best advice I ever got about marriage and raising kids is to remember that Sarah and I are a team, no matter what happens it’s us vs. them. And today, more than ever, it’s me and Sarah, Na’amah and Ellah—one team, ready to face whatever challenge life throws at us. S: Best advice for raising kids—and life in general? Never lose your sense of humor. And teach your children well—that they should never do to others what they don’t want done to them. That is our mantra in our home. Dining: (We don’t get out much) but we enjoy all things pizza, falafel and anything with Sriracha sauce or hummus on it. Benji has been experimenting with a vegan diet since March . . . that’s been interesting. 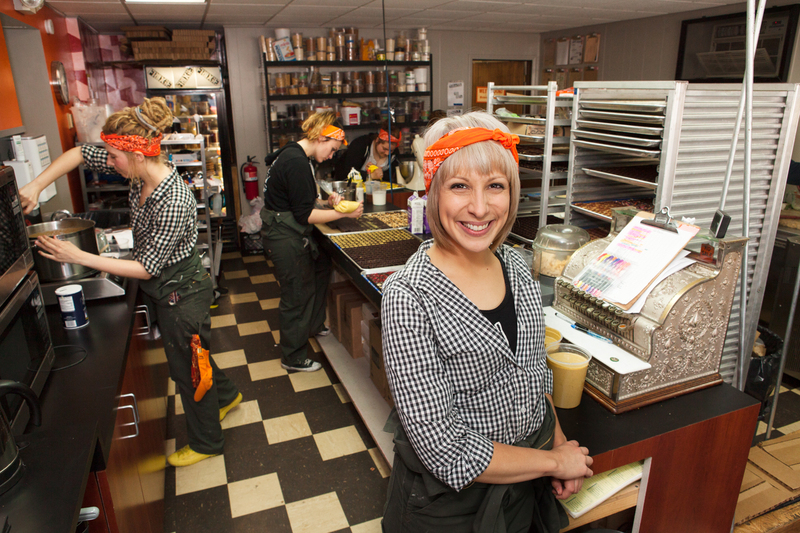 Places to meet for coffee: Great Lakes Coffee Roasters, The Roasting Plant . . . we like to support local businesses.